Steve Jobs (Feb 24, 1955 – October 5, 2011) was an American businessman and inventor who played a key role in the success of Apple computers and the development of revolutionary new technology such as the iPod, iPad and MacBook. Steve Jobs was born in San Francisco, 1955, to two university students Joanne Schieble and Syrian-born John Jandali. They were both unmarried at the time, and Steven was given up for adoption. Steven was adopted by Paul and Clara Jobs, whom he always considered to be his real parents. Steven’s father, Paul, encouraged him to experiment with electronics in their garage. This led to a lifelong interest in electronics and design. Jobs attended a local school in California and later enrolled at Reed College, Portland, Oregon. His education was characterised by excellent test results and potential. But, he struggled with formal education and his teachers reported he was a handful to teach. At Reed College, he attended a calligraphy course which fascinated him. He later said this course was instrumental in Apple’s multiple typefaces and proportionally spaced fonts. In 1974, Jobs travelled with Daniel Kottke to India in search of spiritual enlightenment. They travelled to the Ashram of Neem Karoli Baba in Kainchi. During his several months in India, he became aware of Buddhist and Eastern spiritual philosophy. At this time, he also experimented with psychedelic drugs; he later commented that these counter-culture experiences were instrumental in giving him a wider perspective on life and business. Job’s first real computer job came working for Atari computers. During his time at Atari, Jobs came to know Steve Wozniak well. Jobs greatly admired this computer technician, whom he had first met in 1971. In 1976, Wozniak invented the first Apple I computer. Jobs, Wozniak and Ronald Wayne then set up Apple computers. In the very beginning, Apple computers were sold from Jobs parents’ garage. Over the next few years, Apple computers expanded rapidly as the market for home computers began to become increasingly significant. In 1984, Jobs designed the first Macintosh. It was the first commercially successful home computer to use a graphical user interface (based on Xerox Parc’s mouse driver interface.) This was an important milestone in home computing and the principle has become key in later home computers. Despite the many innovative successes of Jobs at Apple, there was increased friction between Jobs and other workers at Apple. In 1985, removed from his managerial duties, Jobs resigned and left Apple. He later looked back on this incident and said that getting fired from Apple was one of the best things that happened to him – it helped him regain a sense of innovation and freedom, he couldn’t find work in a large company. On leaving Apple, Jobs founded NeXT computers. This was never particularly successful, failing to gain mass sales. However, in the 1990s, NeXT software was used as a framework in WebObjects used in Apple Store and iTunes store. In 1996, Apple bought NeXT for $429 million. Much more successful was Job’s foray into Pixar – a computer graphic film production company. Disney contracted Pixar to create films such as Toy Story, A Bug’s Life and Finding Nemo. These animation movies were highly successful and profitable – giving Jobs respect and success. In 1996, the purchase of NeXT brought Jobs back to Apple. He was given the post of chief executive. At the time, Apple had fallen way behind rivals such as Microsoft, and Apple was struggling to even make a profit. Jobs launched Apple in a new direction. With a certain degree of ruthlessness, some projects were summarily ended. Instead, Jobs promoted the development of a new wave of products which focused on accessibility, appealing design and innovate features. The iPod was a revolutionary product in that it built on existing portable music devices and set the standard for portable digital music. In 2008, iTunes became the second biggest music retailer in the US, with over six billion song downloads and over 200 million iPods sold. In 2007, Apple successfully entered the mobile phone market, with the iPhone. This used features of the iPod to offer a multi-functional and touchscreen device to become one of the best-selling electronic products. In 2010, he introduced the iPad – a revolutionary new style of tablet computers. The design philosophy of Steve Jobs was to start with a fresh slate and imagine a new product that people would want to use. This contrasted with the alternative approach of trying to adapt current models to consumer feedback and focus groups. Job’s explains his philosophy of innovative design. Despite, growing ill-health, Jobs continued working at Apple until August 2011, when he resigned. Jobs earned only $1million as CEO of Apple. But, share options from Apple and Disney gave him an estimated fortune of $8.3billion. In 1991, he married Laurene Powell, together they had three children and lived in Palo Alto, California. In 2003, he was diagnosed with Pancreatic Cancer. Over the next few years, Jobs struggled with health issues and was often forced to delegate the running of Apple to Tim Cook. In 2009, he underwent a liver transplant, but two years later serious health problems returned. He worked intermittently at Apple until August 2011, where he finally retired to concentrate on his deteriorating health. He died as a result of complications from his pancreatic cancer, suffering cardiac arrest on 5 October 2011 in Palo Alto, California. In addition to his earlier interest in Eastern religions, Jobs expressed sentiments of agnosticism. Quote in Biography by Walter Isaacson. Steve Jobs is buried in an unmarked grave at Alta Mesa Memorial Park, a nonsectarian cemetery in Palo Alto. Citation: Pettinger, Tejvan. 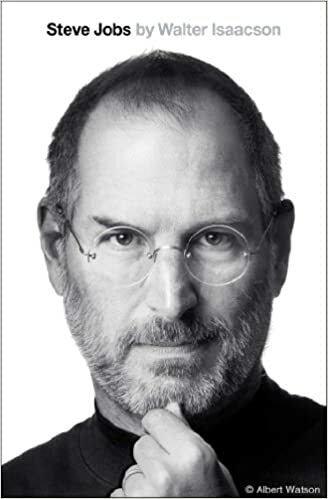 “Biography of Steve Jobs”, Oxford, UK. www.biographyonline.net, 25th Feb. 2012. Last updated 11th March 2018. 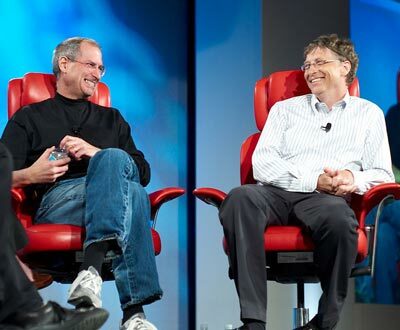 Famous Entrepreneurs – Famous entrepreneurs who have set up and created successful businesses, including Henry Ford, Anita Roddick, Steve Jobs and Bill Gates. Famous Americans – Great Americans from the Founding Fathers to modern civil rights activists. Including presidents, authors, musicians, entrepreneurs and businessmen. Featuring Thomas Jefferson, Abraham Lincoln, Madonna, Oprah Winfrey. Business people – Famous businessmen and women. Including Bill Gates, Richard Branson, Donald Trump, Oprah Winfrey, Henry Ford and Steve Jobs. This is very inspirational to all of us in the world today. He made the impossible the possible, he will always be remembered for his great work done. Congrats Steve you are an inspiration! He made life easier for us all, nothing would be the way it is today without him. Steve jobs! His lesson reminds alot,but Steve went to school ,through colleges he attained ajob that has resulted him into many champions in business and other s.now how can someone has no such gualification also leave such great impact.